Disney’s Tangled has much more in common with the three Lord of the Rings films than it does with the story of Rapunzel. I’m not kidding. A kid-friendly throwback film to Disney greatness follows the same exact story as the entire Lord of the Rings trilogy. Don’t believe me? I am so excited to show you all of their similarities. Let’s journey to Middle-earth and climb the tallest tower to discover how Tangled and The Lord of the Rings compare. There’s a great backstory leading up to the films’ events. A magical item possesses the power to prolong life. A rogue with a mysterious past helps inexperienced travelers on their journey. The heroes stop at a tavern to rest. A character that is addicted to the magical item pursues its wielders. A tower figures prominently in the story. In their most desperate moment, the heroes use a magical light to lead them out of darkness. Some dark minions do the dirty work of the main villain in pursuit of the magical item. A supporting character personifies loyalty to his master at any cost. A treacherous character drives a wedge between two good friends. The main character gets their finger or hair cut off, which destroys the magical item and leads to the villain’s demise. A royal heir has the power to heal those who would otherwise die of their wounds. The king (or princess) returns. These films manage to effectively convey a lot of backstory in the first few minutes. The Lord of the Rings has thousands of years to cover, and it sifts through the voluminous material of the book as quickly as possible, focusing on the key events that we need to know to understand the significance of the One Ring and how it winds up in the possession of a Hobbit. 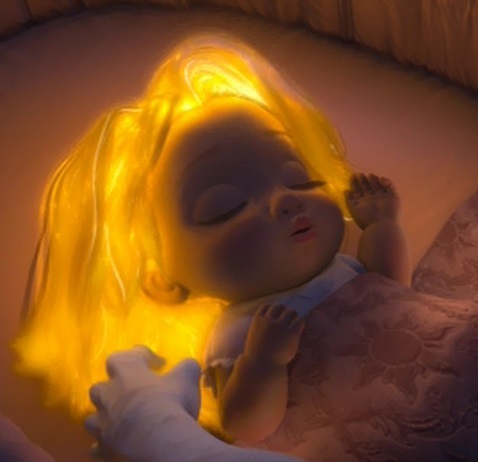 Tangled embellishes the Rapunzel story, showing how a magical healing flower winds up being transferred into Rapunzel’s hair from her birth. A magical item extends life, but can be highly addictive to those who come in contact with it. The One Ring contains Sauron’s power, and anyone who holds it even just once can live virtually forever. 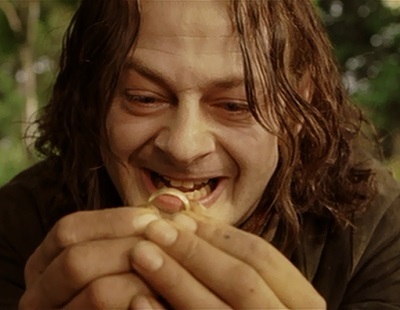 Gollum used the Ring to prolong his miserable, lonely existence for hundreds of years until it was found by Bilbo Baggins. Bilbo later gives it to his heir, Frodo. 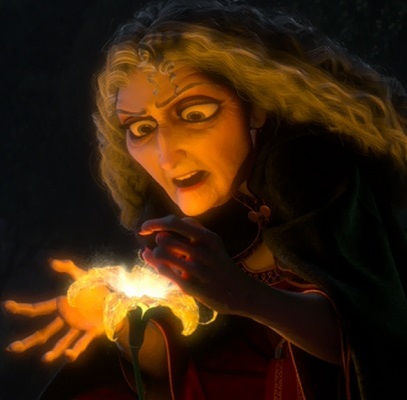 Mother Gothel used the power of a magical flower for hundreds of years to keep herself young and beautiful until the plant was discovered by a king who used it to save the life of his wife. Its power not only saves her, but it infuses their daughter’s hair with its power. This setup creates sympathy for Gollum and Gothel while still exposing their devious natures. Gollum has a good reason for his obsession with the Ring, and Gothel has an excellent reason to keep Rapunzel in a tower, safely hidden from her true parents and from anyone else who would try to use her hair’s power. A rugged individual, with more than one identity, offers to help the hero in his/her journey. Frodo and several Hobbit companions start off on a journey to get rid of the Ring, and they meet up with a Ranger named Strider early in their adventure. 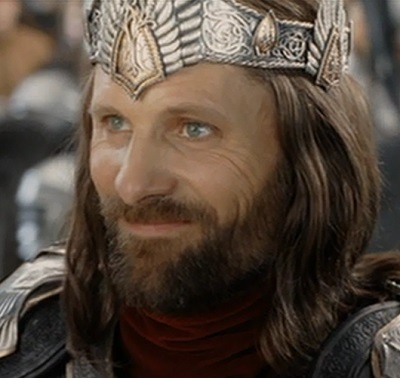 He helps them through many trials and it is revealed that he is actually the heir to a kingdom and his true name is Aragorn. 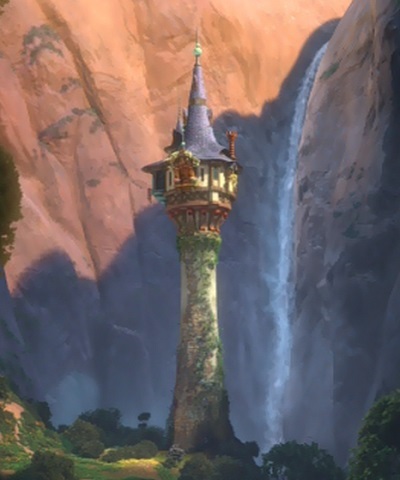 Rapunzel desperately wants to leave her tower for one night, but she lacks the courage to stand up to Gothel until Flynn Rider accidentally finds her. She enlists him to act as her guide and they face many challenges together. He later reveals that his real name is Eugene and he dreams of having his own castle. Wow. Rider and Strider. Eugene and Aragorn. Those names are pretty similar, if you ask me. The heroes have a wild misadventure at a tavern. 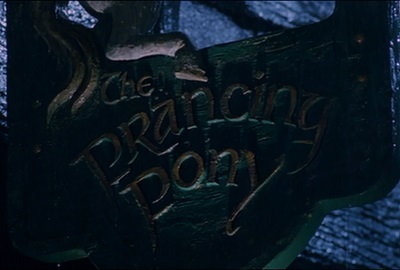 The Hobbits find their way to a bar/hotel called the Prancing Pony where they meet Strider and have a close call with some monstrous beings known as the Ringwraiths, who are hunting for the Ring. But they manage to escape, thanks to Strider’s help. 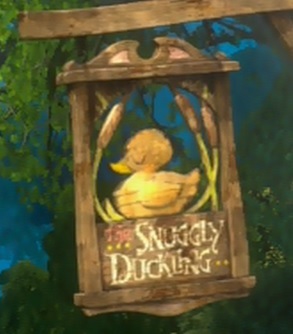 Rider takes Rapunzel to a villainous hideout deceptively named the Snuggly Duckling. They get into trouble and are almost spotted by the kingdom guards and the Stabbington brothers, who have all been betrayed by Rider and are hunting for a crown that he stole. They escape with the help of the ruffians at the bar. The character that had the magical item for many years pursues its new owner in an effort to retrieve it. Gollum believes Bilbo stole the Ring from him, and he is prepared to do whatever is necessary to get it back for himself. He follows the Hobbits from a distance for a long time, but he finally catches up with them and pretends to help them on their journey. Gothel discovers that Rapunzel has left her tower with Rider, and she easily follows their trail. However, she keeps her distance until the time is right and she pretends to be worried about Rapunzel’s well-being and feelings, all the while plotting to manipulate her into returning to her tower forever. 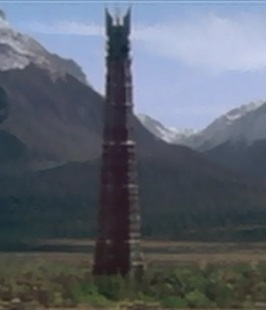 A tower serves as a hero’s prison and as a springboard for a villain’s death. Gandalf is held prisoner in the tower of Isengard for a short time, similar to how Rapunzel is held prisoner in a tower. Though it’s not in the book, the film The Return of the King shows Saruman falling to his death from his tower, just like we see happen to Gothel at the end of Tangled. A magical light source is used at a time when the heroes desperately need light to avert death. When facing the giant spider called Shelob in a dark cave, Frodo (and later Sam) uses the Phial of Galadriel to find his way. 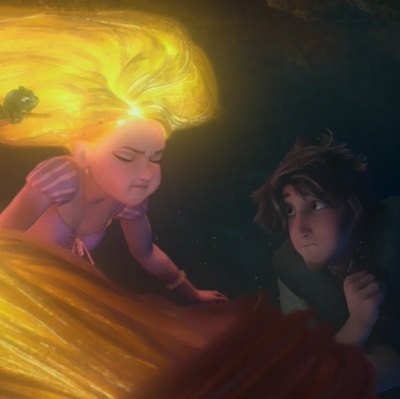 Rapunzel and Rider are about to drown in a pitch-black cave, and Rapunzel has the brilliant idea to sing so her hair lights up and shows them the way out. Evil minions of the main villain do their best to find the magical item for their own selfish reasons but are fooled by the real villain. The Ringwraiths used to be human kings thousands of years ago, but they were corrupted by rings that are subject to Sauron’s power. They were deceived by Sauron and are now his slaves, forced to roam Middle-earth as disembodied beings seeking the Ring. The Stabbington brothers helped Rider steal the crown at the start, but they were betrayed and later team up with Gothel because of their mutual hatred of Rider. But Gothel betrays them, too, by making them think that they can get Rapunzel and her magical hair for themselves. She has no intention of letting that happen, but she wants to use them for her own purposes to make sure Rapunzel never leaves her again. Notice that the Stabbington brothers are pursuing a crown at the start, just like the Ringwraiths, who used to be kings, are pursuing power and new crowns in Sauron’s dark kingdom. One character refuses to give up until their mission to help their master is complete. 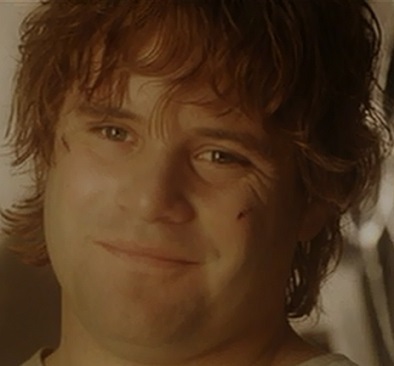 Samwise Gamgee is the ultimate friend. He refuses to leave Frodo’s side, even when it means putting himself in peril. Maximus, one of the kingdom’s horses, is the same way in Tangled. 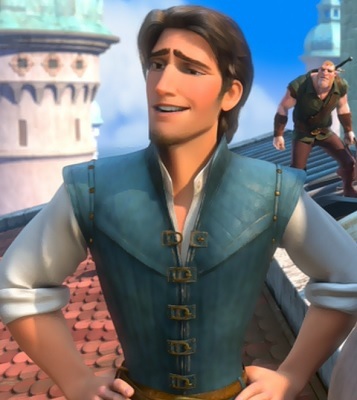 He is fiercely loyal to the law and later to Rapunzel. He goes to great lengths to make sure justice is served and that the heroes triumph. The villain sows the seeds of distrust between two heroes. Gollum makes Frodo believe that Sam will try to steal the Ring from him, and he makes it look like Sam wasted all their food. Gollum succeeds in getting Frodo to reject Sam right at a critical point when he needs Sam’s help the most. Thankfully, Sam realizes that Gollum tricked them shortly after and he hurries back to help his master. Gothel feeds Rapunzel’s doubts by suggesting that the only reason Rider is helping her is to get his hands on the crown. Later, she gets the Stabbington brothers to make it look like Rider heartlessly ran off with the crown when that wasn’t his intention at all. Gothel then steps in and uses all of this to manipulate Rapunzel into thinking that she can only trust Gothel. Luckily, Rider figures out what really happened and he races to help Rapunzel. The magical item is destroyed in a surprising way, foiling all the villain’s plans. 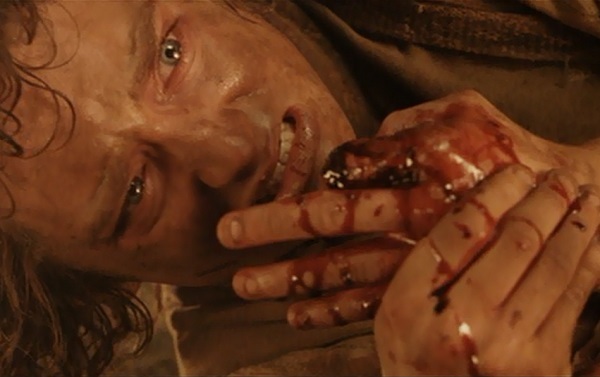 When he finally reaches the Cracks of Doom, Frodo is unwilling to destroy the Ring and he puts it on his finger in defiance. However, at that moment Gollum arrives and bites Frodo’s finger off. After a short struggle, Gollum falls into the lava, melting the Ring and destroying Sauron’s power forever. Rapunzel is about to run away with Gothel and be her slave forever in return for Rider’s life, but Rider has other plans. He gets her to lean in close and before she or Gothel can stop him, he slices Rapunzel’s hair, thus destroying its magical powers and ending Gothel’s life. A royal heir heals mortally wounded people. 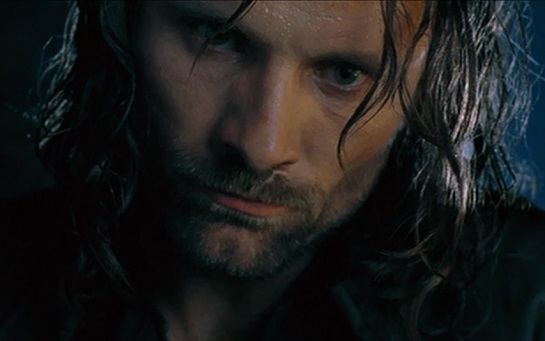 Just like the ancient kings of Gondor before him, Aragorn knows how to relieve suffering and save the lives of people who would otherwise die. Rapunzel’s healing power, it turns out, isn’t just in her hair. It’s inside her. She sheds a tear over Rider’s body after he dies from a wound sustained by Gothel. The tear heals him completely. A member of the royal family returns to reclaim their crown. After Sauron is no longer a threat, Aragorn arrives in Gondor and is crowned king, he being the rightful heir to the throne. Everyone who helped make this coronation possible is also celebrated in their own way. With Gothel gone, Rapunzel is free to return to her grieving parents and finally be part of her family again. The entire kingdom celebrates the return of its lost princess, and everyone who helped her find her way back has their own happy ending. Who knew that a relatively short animated movie like Tangled could have so much in common with an epic, nine-hour story contained in three films based on one of the greatest fantasy novels of all time? Yours truly, that’s who. I hope you enjoyed getting this new perspective on these excellent films. I don’t consider it a slight to say that certain films resemble each other in remarkable ways. I think it deepens the viewing experience by noticing where filmmakers may have drawn their inspiration from and how the same story can be told in unique ways. The Lord of the Rings films are some of the best in their genre, and Tangled is one of the best animated films of the past decade, at least. They both weave a complicated web, but everything gets straightened out in the end. This entry was posted in Movie Matchups and tagged disney, films, humor, lord of the rings, movie review, movies. Bookmark the permalink. Despite all the similarities you have pointed out, they are very different stories and the scale of Lord of the Rings is epic. Tolkein took the “fairy story” to a whole new level in his epic tale of a world wide fight between good and evil. True, he used elements found in traditional folk tales, which the writers of “Tangled” also drew on to expand their story, but that still does not make them the same. Thank you for your comment. It’s really fun to see how similar these stories are at their core. The Lord of the Rings, for all its pageantry and subplots, is a tale of two Hobbits who take a ring to Mordor. Tangled, for all its pageantry and subplots, is a tale of a girl who goes on a journey to find her true identity. Take the battles out of The Lord of the Rings and it’s little different than Tangled and other journey stories. after reading your amazing article i realized why i love both stories so much, they are related!! seriously props to you!